New Year's Eve celebrations are a few hours away, so in keeping with the giddy atmosphere, here's a party prop to guarantee laughs! 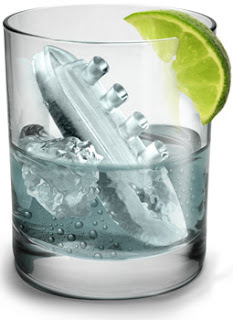 How about an ice cube tray featuring ice burgs and ocean liners? Well, Kate & Leo are back together on the silver screen making movie magic, so the time is just perfect! Your party & drinks will be remembered for their titanic impression! Just don't be surprised when that annoying guy who see only once a year hollers, "ice cube, right ahead!" Just remember...you only see him once every 12 months! Barclay says HAPPY NEW YEAR! Love the ice cubes! I got a funny ice tray gift -- it's teeth, like dentures! So you can freeze 'em up, add some red food colouring, and presto -- trick your guests into thinking they have someone's dentures in their cocktail. Cruel, but fun. Haven't tried them out yet.